These beautiful tarts are naturally sweetened and so rich and creamy. Feel free to have seconds with this guilt free, drool worthy dessert by Paleomg. These delicious things will have you second guessing if they are actually healthy or not. But never fear this salted caramel fudge recipe by Feel Great in 8 is vegan, dairy-free, and refined sugar-free! There is something about warm, sweet, caramel apples that is so comforting and delicious. Holistic Squid hit this recipe out of the ball park! Get your slow cookers out as you are not going to want to miss this delicious dessert. Not only is this homemade frozen yogurt super easy to make (all you need is a blender!) it’s naturally sweetened, the perfect texture, and so easy to change which flavor you want! DIY Natural has made a great recipe! Yes even you chocolate lovers get a delicious healthy dessert. 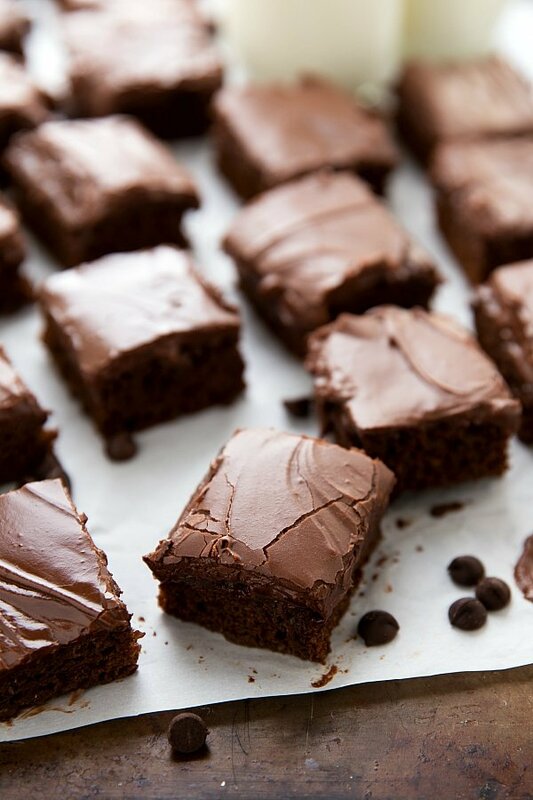 You can’t go wrong with these brownies by Chelsea’s Messy Apron that are warm, gooey, chocolaty and perfect. I have always been a lover of cookies. I have also been a lover of the combination of chocolate and mint. These vegan mint chocolate crinkle cookies from Vegan Family Recipes hits both on the head. So. Good. I am such a donut girl – give me a donut and just about all my troubles melt away. These grain, dairy-free and paleo glazed chocolate donut holes by Wellness Mama are divine. Not only are these lemon bars the perfect combination of a crunchy crust and tangy lemon custard, they are super healthy. Plus Food Faith Fitness has given us these delicious bars with only 5 ingredients! So simple and so good. Have I mentioned how much I love cookies? I also love when baking is make super simple and easy – well with only three ingredients you can’t get much more simple then these 3 ingredient peanut butter cookies. One of my favorites. Another great dessert that only has three ingredients! These are the perfect fudgy desserts for the chocolate lovers. Veggie and the Beast has put something delicious together that will have you coming back for more. These Somoa Bars by the Bakerita are gluten free, Paleo and Vegan and oh so delicious. That chocolate, that coconut, the crust! You might just want to double the batch as you can’t go wrong with these bars and they are bound to go fast! Yum! Pie is one of those classic desserts that just about anyone loves. This chocolate pudding pie by Deliciously Organic is the perfect pie to serve to your friends and family as they can indulge without fear of any unhealthy ingredients! So smooth and delicious.